Creates silky soft luxurious hair with maximum body & shine! slēk is a new weightless structural enhancing inner-moisturizing cuticle corrective hair treatment. slēk has hydrating properties that help soothe dry, damaged, chemically treated, fine and normal hair types for vibrant, voluminous hair that shines. Hyper-charged moisture molecules and shape memory molecules work on the inside of the cuticle; not coat the outside of the hair as all other products do. The results are spectacular and last for weeks! Continual use delivers 24/7 silky-soft beautiful hair, for everyone, every time! Bioveta slēk is a weightless hair treatment that increases moisture and improves the hair’s inner structure for everyday revitalization. Bioveta’s renewal regimen provides trusted products and proven ingredients that help maintain balance in your daily life. 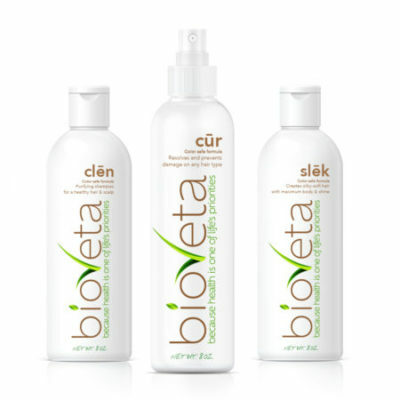 As a treatment: After shampooing with Bioveta clēn apply enough slēk to cover all of the hair completely and wait 10 minutes. Rinse. Spray cūr to close the cuticle and seal with its unique, tangle free properties that lock in color and eliminate all hair problems. For daily use: Use a dime to almond size amount of slēk and rinse for lubricity and styling support. Adjust amount to your own personal preference as needed. Specifically designed to work in conjunction with Bioveta’s synergistic renewal regimen and is perfect for all hair types and textures. To activate its body memory molecule, apply Bioveta cūr after using slēk.